Panasonic Corporation developed a white OLED lighting panel that is the world's highest luminous efficiency - 114 lm/W for a light-emitting area of 1 cm2. Panasonic also developed a larger panel (25 cm2) with 110 lm/W. The panels also feature long lifetime - over 100,000 hours (LT50) and a brightness of of 1,000 cd/m2. The panel thickness was less than 2 mm. To achieve this high efficiency, Panasonic focused on an all-phosphorescent design (with an optimal stacked layer design) and new light extraction technology. 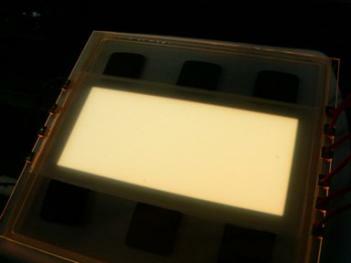 Panasonic used a Built-up Light Extraction Substrate (BLES) by optimizing the arrangement of the film, glass and air to suppress light confinement in the OLED. This enable them to achieve about 2.5 times improvement in the light extraction efficiency, which is about 50% in the new panels. Panasonic says that in older technology the light extraction efficiency stayed below 40%. Panasonic says they hold 30 patents in Japan and 17 overseas - all related for this new development. While this may be the world's most efficient panel, it's not the most efficient OLED device ever made. It's possible to make more efficient OLEDs but only in small (2x2 mm or so) devices. 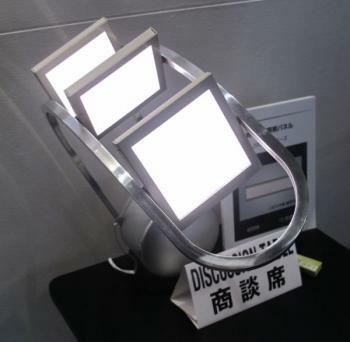 In 2011, Panasonic Electric Works announced that they developed a device with 128 lm/W efficiency. In March 2013 NEC Lighting announced that they developed a device that has an efficiency of 156 lm/W. NEC's device is the world's most efficient OLED to date. Panasonic teamed up with Idemitsu Kosan to establish Panasonic Idemitsu OLED Lighting (PIOL) which handles OLED lighting production and marketing. PIOL currently produces 100x100 mm panels that feature 30 lm/W, 10,000 lifetime (LT70) and a high (over 90) CRI. PIOL's roadmap includes a 100 lm/W, 5000 cd/m2 and 20,000 hours lifetime (LT70) panel in 2015 and 130 lm/W, 40,000 hours panels in 2018. It seems that with this new development they will be able to reach their 2015 efficiency target. Yet, the efficiency and lifetime are still far behind LEDs. Therefore I think the Hybrid model is still the way to go..